In our recent webinar with Institute for Supply Management (ISM), Lane Burkitt, ISM’s Managing Director of Global Operations, and our Chief Strategy Officer, Steve Griffiths, talked about ways technology can eliminate maverick spend. To learn more, check out this clip or read the transcript below (and if you haven’t checked out the webinar yet, click here to watch the whole thing)! Both of you have mentioned a lot about technology and how it’s shaping procurement, and its ability to solve big problems – especially with maverick spend. Can you tell us about some of those problems? STEVE: Clearly, better visibility really defines and identifies maverick spend, and gives you the opportunity to go in and explore the root causes of that maverick spend. Click To Tweet Additionally, through purchasing systems, it actually can guide the behavior. So, I don’t only have to be retrospective in how I do this, but I can actually be prospective with the technology. It actually does guided buying processes. So then, if I’m a maintenance person, I’m looking for a part to fix something out in the plant, then the tech can actually lead me to my options for fulfilling that need. Or, it can guide me to the right suppliers to engage with. Spend analytics identifies the leakages, but anything you do to make buying compliant easier than buying non-compliant will always improve on maverick spend. People like to do what’s easy, and if the tech makes it easy, then people will be pretty compliant. LANE: Absolutely. What Steve was talking about first there, as far as getting the analysis done, it’s so much better now. We have much better systems that are able to look at data from multiple databases and pull it all together. It’s much quicker, much more accurate than it used to be. We should be able to see the spend from different systems and compare and look at where we have opportunities to aggregate. And the example that he just gave of the maintenance person having to pull parts. I was thinking of one: the best managed MRO that I’ve ever seen in a plant. But it was all reliant on the personality of one person. It was not system-based. They had a computer system and had everything set up and very, very accurate, but the reason it was that accurate is because there was one person with a very strong personality who said, “We are going to keep this under control.” And they controlled all of the maintenance people, and all of the people in the operations respected that person’s authority over that particular area. But we can’t be reliant on that. We can’t be reliant on a personality in order to make things accurate. We need to make sure that our technology is enabling us by doing things like creating the right kind of exception reports. We don’t want to look at every single buy. All of the ones that are done correctly and done on-policy and on-contract, we don’t need to review. We do need to review the ones that are not. And the technology can help us separate out the ones that are fine from the ones that are not so that we can only review by exception; the ones where we have to figure out what’s going on. Things like frequency of use of p-cards, and if the frequency changes all of a sudden. We’re going along and we have somebody who uses their p-card three or four times a month, and then all of a sudden, it’s 30 or 35 purchases in a month. What happened? The technology can flag it and say, “Hey, there’s something going on here.” Even with AI (the way it’s framed today), it won’t necessarily tell us why it happened but will tell us where to ask the right questions. How often they are hitting their spending limit, or coming close to their spending limit, is another element that the technology can help us understand. Or, how much they’re using a p-card or going off-contract with a particular supplier. Maybe they’re going off-contract with that supplier because the contract needs to be updated, or the relationship between our business and the suppliers’ business has changed, and the contract is no longer relevant. It needs to be renegotiated. It needs to be changed. Whether because our volumes have gone up or gone down, for whatever reason. Maybe our lead time requirements have changed. Maybe we’ve changed our minimum order quantity, or they have changed their minimum order quantities because of the change of equipment. There are all kinds of things that can influence it, and technology can really help us focus on the things that are going to bring the savings. 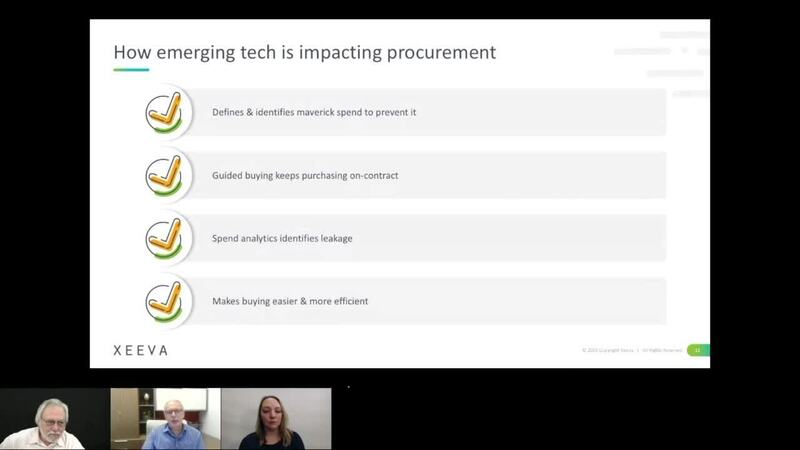 For more on ways how advanced technology is impacting procurement, check out the full webinar!